The goal of this contest is to empower medical students to weigh in on their physical learning environments, which may unintentionally be supporting stereotypes of women, and to share their vision for the optimal anti-bias educational experience. Critical mass theory predicts that women physicians should be advancing faster, paid more and treated with greater respect than is currently happening. Unfortunately, research shows they are not paid or promoted equitably, and too often they are “silenced” or “hidden.” Examples are abundant and range from receiving zero recognition awards to not being invited to give plenary and keynote lectures during which their opinions and vision for the future could be shared with colleagues. For many organizations, excluding women physicians from newsletters or using them to create an “illusion of inclusion” is standard practice. Macro- and microinequities are well documented—creating a theme that is reminiscent of a time decades ago when discrimination against women, including rejecting them as candidates for a medical education altogether, was standard. We looked around our medical schools and noticed a problem: there are too many physical spaces that are not reflective of an educational environment that is focused on dispelling stereotypes and supporting every student. 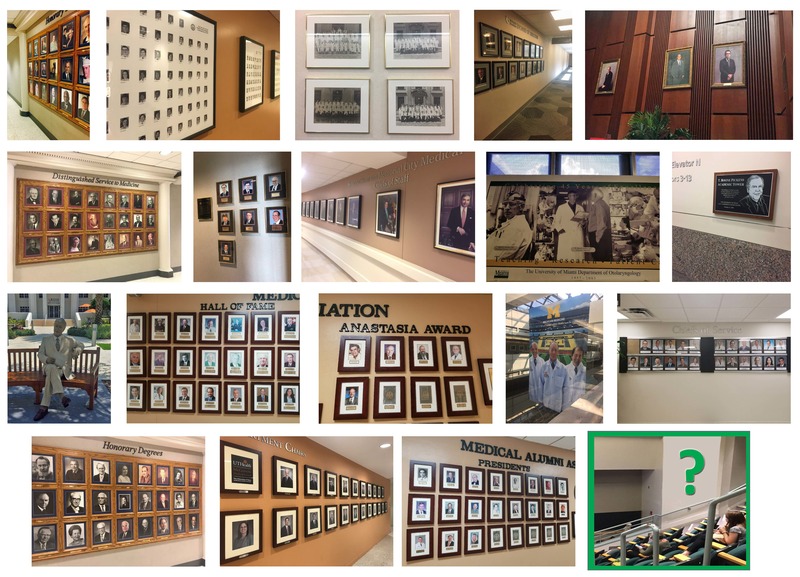 We selected one recurring physical space—walls of honor—that tend to predominantly feature men and on which women may be included in a manner consistent with “tokenism.” Moreover, honor walls rarely feature women physicians with intersectionality (e.g., women of color). These walls may inadvertently suggest and even promote an “in group” (the people in the portraits and the medical students who look like them) and an “out group” (the women physicians who are not featured on the walls and the medical students who look like them). Please do not include images of patients, even if they give consent. This contest is open to all students currently enrolled in a U.S. medical school. Upload your wall design using the form below and provide a brief description in 100 words or less of how your design promotes: medical education (learning), physician/student wellness, patient healing, future innovation, and/or diversity and inclusion. Enter before midnight on October 26, 2017 PST for a chance to win a $500 prize! All finalists will have their work recognized through various channels, including social media. 1. I am a student currently enrolled in a U.S. medical school. 2. Any and all parts of my design (including, but not limited to images, artwork, and text) are original work or free clipart and are not associated with any previously copyrighted material and do violate any third party’s proprietary or intellectual property rights. 3. My design is suitable for display on the wall of any public or private healthcare institution (e.g., medical school, hospital, clinic). 1. Although I may work in any media I choose, each design must be submitted as a single photograph. 2. Acceptable file formats include: .jpg, .jpeg, .png and .gif. 3. I may submit more than one design. 4. I must submit my design(s) by midnight October 26, 2017 PST. 5. Initial entries must be approved as appropriate for display by a panel of judges consisting of healthcare professionals associated with the 2017 Career Advancement and Leadership Skills for Women in Healthcare Conference. 6. Each submission will be judged on its ability to inspire people from all walks of life, enhance learning or well-being, and support an anti-bias educational environment. 7. The winner will be chosen by popular vote of the attendees of the 2017 Career Advancement and Leadership Skills for Women in Healthcare Conference at the Fairmont Copley Plaza, Boston, MA on Nov 2 - 4, 2017. 8. Judges reserve the right to create divisions before the popular vote (e.g., most inspirational or most aesthetic). Each submission will be entered into each division. However, each submission may only win one division. Popular vote and discretion of the initial panel of judges will be used to determine the winner of each division should one entry win the popular vote in more than one division. 9. The winner (or winner in each division) will receive $500. 10. Although I will continue to own the copyright to my design, I agree that the sponsors of the 2017 Career Advancement and Leadership Skills for Women in Healthcare Conference have the right to print, publish, broadcast, distribute, and use in any media now known or hereafter developed, in perpetuity and throughout the World, without limitation my name, likeness and the photograph and description of my design for news, publicity, education, information, trade, advertising, public relations, and promotional purposes without any further compensation, notice, review, or consent, unless prohibited by law. 11. Contest progress can be followed on Twitter #SHELEADS2017 and #WallsDoTalk and online at www.SHELEADSHEALTHCARE.com. Contest: This Contest is being sponsored by organizers of the 2017 Career Advancement and Leadership Skills for Women in Healthcare Conference. The Contest is subject to all applicable federal, state and local laws and regulations and is considered void where prohibited by law. The 2017 Career Advancement and Leadership Skills for Women in Healthcare Conference reserves the right, in its sole discretion, to cancel, terminate, modify or suspend the Contest should virus, bug, non-authorized human intervention, fraud, or other cause beyond reasonable control corrupt or affect the administration, security, fairness, or proper conduct of the Contest. Contestant: By submitting, the Contestant agrees to be fully unconditionally bound by both the submission and official rules and represents and warrants accordance with the eligibility requirements. In addition, the Contestant agrees to unconditionally accept the decisions of the initial judges and conference attendees. Participants need not be present to win. Winners will be notified within 5 days via the email address provided on the entry form. The prize is nontransferable. Any and all prize-related expenses, including without limitation any and all federal, state, and/or local taxes, shall be the sole responsibility of the Winner. No substitution of prize or transfer/assignment of prize to others by Winner is permitted. The odds of winning depend on the number of eligible entries received. The sponsors of the 2017 Career Advancement and Leadership Skills for Women in Healthcare Conference shall have no liability for the Winner’s failure to receive notices due to spam, junk e-mail or other security settings or for Winner’s provision of incorrect or otherwise non-functioning contact information. If the Winner cannot be contacted, is ineligible, or fails to claim the prize within 10 days from the time award notification was sent, the prize may be forfeited and an alternate Winner selected. Originality: If an entry infringes upon the intellectual property right of another, the Contestant will be disqualified at the sole discretion of the sponsors of the 2017 Career Advancement and Leadership Skills for Women in Healthcare Conference. If the content of an entry is claimed to constitute infringement of any proprietary or intellectual proprietary rights of any third party, the Contestant shall, at his/her sole expense, defend or settle against such claims. The Contestant shall indemnify, defend, and hold harmless the 2017 Career Advancement and Leadership Skills for Women in Healthcare Conference from and against any suit, proceeding, claims, liability, loss, damage, costs or expense, which the Conference may incur, suffer, or be required to pay arising out of such infringement or suspected infringement of any third party’s right. Liability: By entering, the Contestant agrees to release and hold harmless sponsors of the 2017 Career Advancement and Leadership Skills for Women in Healthcare Conference and its subsidiaries, affiliates, advertising and promotion agencies, partners, representatives, agents, successors, assigns, employees, officers, and directors from any liability, illness, injury, death, loss, litigation, claim, or damage that may occur, directly or indirectly, whether caused by negligence or not, from: (i) such entrant’s participation in the Contest and/or his/her acceptance, possession, use, or misuse of any prize or any portion thereof; (ii) technical failures of any kind, including but not limited to the malfunction of any computer, cable, network, hardware, or software, or other mechanical equipment; (iii) the unavailability or inaccessibility of any transmissions, telephone, or Internet service; (iv) unauthorized human intervention in any part of the entry process or contest ; (v) electronic or human error in the administration of the contest or the processing of entries. Disputes: This Contest is governed by the laws of the United States and the state of Massachusetts, without respect to conflict of law doctrines. As a condition of participating in this Contest, Contestant agrees that any and all disputes that cannot be resolved between the parties, and causes of action arising out of or connected with this Contest, shall be resolved individually, without resort to any form of class action, exclusively before a court located in Massachusetts having jurisdiction. Further, in any such dispute, under no circumstances shall participant be permitted to obtain awards for, and hereby waives all rights to, punitive, incidental, or consequential damages, including reasonable attorney’s fees, other than participant’s actual out-of-pocket expenses (i.e. costs associated with entering this Contest). Participant further waives all rights to have damages multiplied or increased. Inquiries: Sponsors of the 2017 Career Advancement and Leadership Skills for Women in Healthcare Conference may be contacted via the Contact Us form located at www.SHELEADSHEALTHCARE.com. Vote for your favorite redesign of a typical medical school- or hospital-affiliated portrait wall. patient healing, future innovation, and diversity and inclusion? Please note that all contestants are medical students, not professional artists. They are in the process of learning about diversity and inclusion and all submissions are “concepts”--not final designs or installations. We appreciate your respectful and positive comments and support of the medical school contestants!